Crumpler Cashmere Blazer is a fully padded laptop bag or notebook computer carrying case for laptop computer with LCD screen up to 17-inch in size. 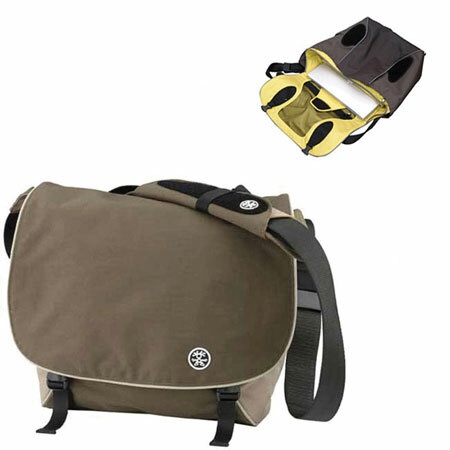 Crumpler Cashmere Blazer features original 1000d Chicken Tex hyper performance accessory fabric, waterproof ripstop lining, thick protective padding, adjustable padded shoulder strap, 5 pockets (3 zipped) for accessories, Quick Flick buckles. The Crumpler laptop bag has the size of approximately 20 x 18 x 8 inches (WxHxD) and the dimension of laptop pocket is 18 x 16 x 3 inches (WxHxD). (In case you don’t know, W= Side to Side, H= Top to Bottom and D= Front to Back). The Cashmere Blazer weighs about 51 oz, and available in Dark Brown and Oatmeal colors. O’Grady’s PowerPage (dead link) reviews Crumpler Cashmere Blazer carrying case and concludes that overall The Cashmere Blazer is my favorite weekend bag, especially in the summer. It not only holds my MacBook Pro, power adapter and bunch of trade magazines, it also held all of my clothes on a weekend trip to Nantucket. If you’re looking for a quality bag with good looks that can also lug your A wardrobe in style, then check it out. For same type of bag in a slightly smaller package from Crumpler, check out The Horseman, The Part and Parcel and The Hee-Goer.